Practice 1: Light blue works high tempo tricks, turns on word of the coach passes to the clour designated who returns pass one touch back to lightblue. colours rotate quickly. all players have to be light blue for 3 minutes. 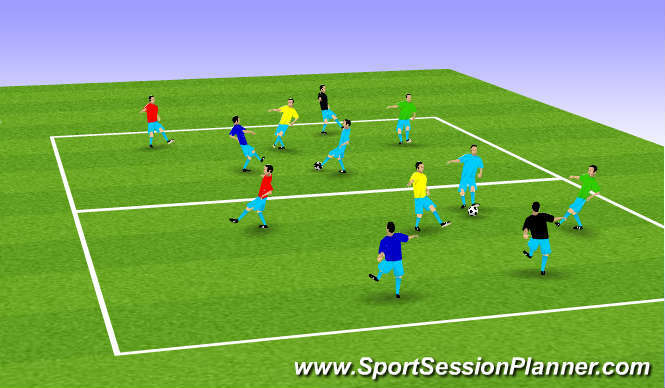 Practice 2: Same set up players pass in rotation on the move at a high tempo. Practice 3: Same set up only colours designated two touch one touch. Reds and Blues link through gate to each other mucst recive and turn = 1 goal. Progression to two goals or gates. Can then progress to two goals ar each end. Progess to game. Individual coaching in the game. Strikers M/F. Defenders.relating to passing peciving and support for each other. 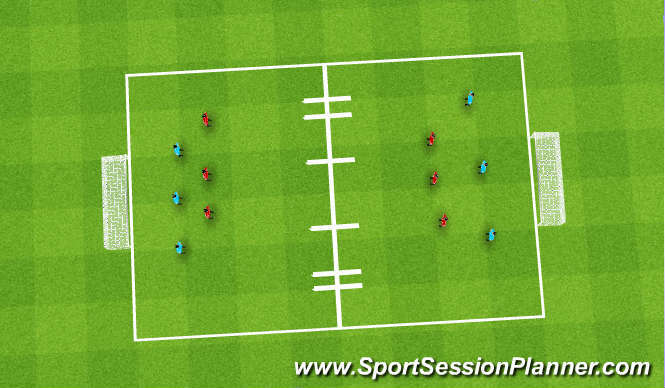 Passing/Reciving/Turning weight of passing,timingof pass, parts of the foot to pass and receive. Understanding as and individual where man on the ball needs support re angle and distance. Anarobic work with agility, balance and timing. Difficult task for some players to communicate. Some very good play, good high tempo and goodunderstanding of support for each other.